At the end of the Civil War, Pittsburgh was a bustling industrial city that generated a tremendous amount of smoke and soot which the city’s workers lived in uncomfortable proximity to. Mount Washington (then known as “Coal Hill”), rose far enough above the city that it could provide a cleaner place to live with considerably better air. Unfortunately, though geographically close, it is precipitously steep and at that time was only accessible via a long, circuitous and often muddy trail. Clearly this was not an ideal location for commuters on foot. If a passenger incline could be built to transport workers from the mountain to the city, it would afford an attractive residential area above the not-so-fresh air of the city below. Building a residential neighborhood on Mount Washington would also greatly benefit the landowners and businessmen there. Walking up and down Mount Washington via footpaths like this would have been a tough way to commute. The Mon Incline circa 1888. The smokestacks of the powerhouse are visible here. In February 1854, Pennsylvania approved “An Act to Incorporate the Mount Washington Inclined Plane Company” which granted the group the “power to construct one or more inclined planes, to run cars from any point or points on the river bank between the Monongahela Bridge and Jones’ Ferry… to the brow of Coal Hill...” This group began to lay the groundwork for an incline, but was impeded by land disputes over the right-of-way, and the Civil War. 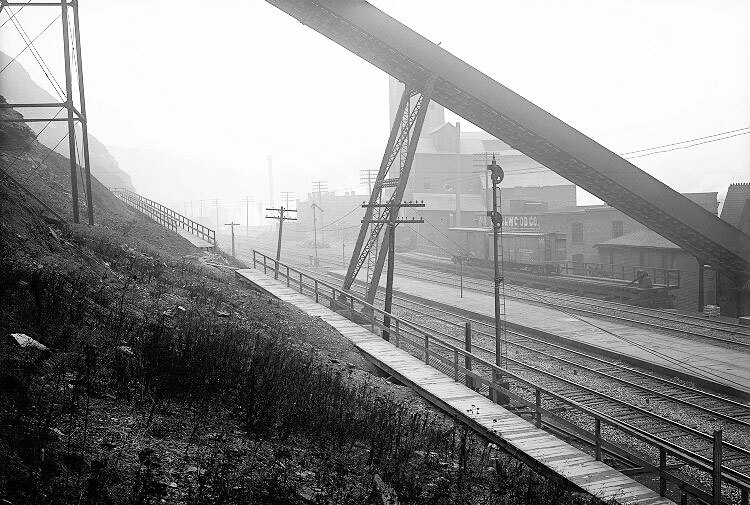 Following the war, in April 1867, a charter was granted for the formation of the Monongahela Inclined Plane Company, which would build a passenger incline between Monongahela Borough (Carson Street) and Coal Hill (Mount Washington). Move the slider to compare the incline then and now. The station was rebuilt in 1904. The freight incline was located where Port Authority employee parking is now. Could this dapper gent be Samuel Diescher? 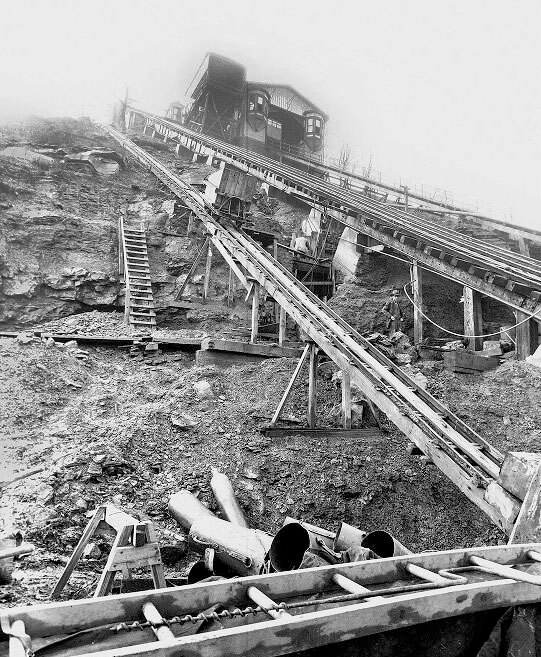 It would be the first incline built primarily for transporting people rather than coal or construction materials. Civil and mining engineer John J. Endres submitted a plan that was selected over other plans submitted by engineers from around the country. The surveyor, J.S. Kirk suggested two sites, the current location of the Mon Incline and the location of the Duquesne Incline which would be built seven years after the Mon Incline. The Mon location was chosen because it was accessible to more people. By the end of November 1869, the incline was under well under construction. Endres worked with Pittsburgh manufacturer Jones & Laughlin to create the iron T rail tracks which were supported by a wooden trestle. The Iron City Bridge Company manufactured an iron bridge which supported the incline over the railroad tracks located just above the lower station. The original upper and lower stations of the incline were built by a local carpenter, R.J. Smith. Price & Long of Philadelphia manufactured the incline plane cars at a cost of $3,057. John Roebling, of Brooklyn Bridge fame, manufactured the steel cables used to pull the first incline. Move the slider to compare the incline then and now. This view from across the Monongahela River is roughly the view from the defunct Monongahela House luxury hotel where Caroline Endres lived for more than a year while working on the incline. The Monongahela Incline opened on May 28, 1870. When it opened, the fare was six cents. 994 people paid for fares on the first day and 4,174 people paid the fare on the second day of operation. Two steam engines located in a two-story brick powerhouse on Grandview Avenue across the street from the upper station of the incline provided the drive force which powered the system until 1935. You can see the smokestacks of the two-story brick engine house rising above the upper station in early photographs. The operator/engineer of the incline, who sat in a glass enclosure known as the ‘pulpit,’ overlooking the incline tracks, used hand throttle levers and a foot brake to control the cars ascending and descending the tracks. In 1870, the engineer and conductor worked from 6 a.m. until 11 p.m. After the construction of the freight incline in 1884, the shifts were reduced to 12 hours. The first engineer was George Naysmith, with an assistant, Campbell K. Smith. 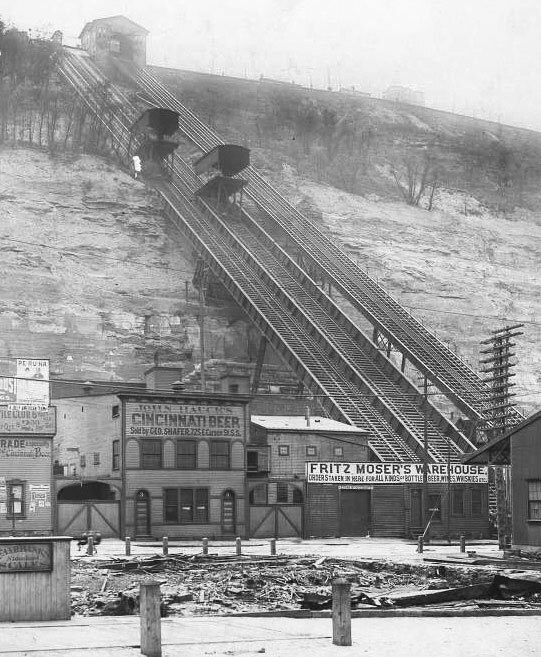 The Mon Incline circa 1900. The Mon Freight Incline undergoing repairs in 1926. The incline was immediately successful and precipitated the rapid development of Mount Washington which previously had been sparsely populated. 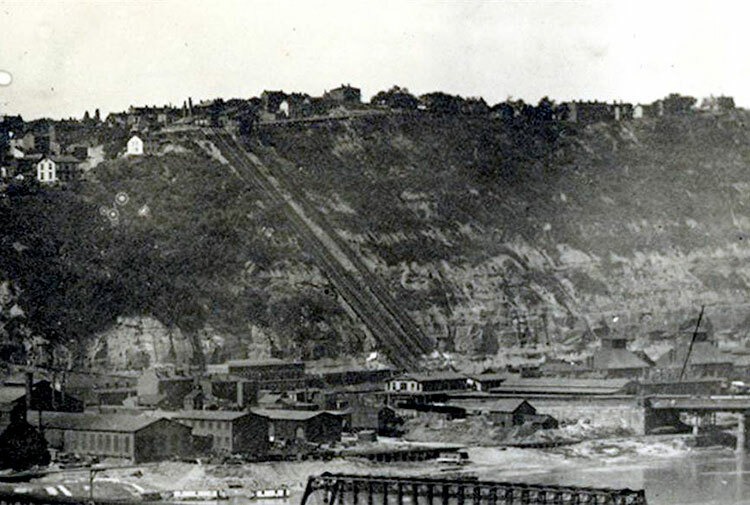 To that end, the Monongahela Inclined Plane Company decided to construct an additional freight incline adjacent to the passenger incline which could carry building and construction materials up the mountain. The freight incline opened on March 31, 1884. The cars of the freight incline were 17 feet wide by 32 feet long. In 1881, Samuel Diescher, an engineer who had worked for Endres, prepared a plan to rebuild significant portions of the plane using an iron trestle with steel rails to replace the wooden structure. Diescher also redesigned the power system and made engineering improvements, adding a “steam chest” which would supply reserve pressure to the system when the primary system lost power too quickly. The lower station which stands today was built in 1904 by MacClure & Spahr, prominent Pittsburgh architects. Albert Spahr had received the prestigious Beaux Arts Society of New York Medal in 1896. McClure & Spahr also designed several other prominent Pittsburgh buildings such as the Union National Bank building, known as The Carlyle today, it still stands at Fourth Avenue and Wood Street. The freight incline was closed and dismantled in 1935 due to the improved accessibility of Mount Washington by car (P.J. McCardle Road was completed in 1928). Also in 1935, the passenger incline was converted to electric, powering a motor drive system designed and manufactured by Otis Elevator Company and installed under the upper station. This system was replaced in 1994 with a system designed by Baker and Associates of Beaver, Pennsylvania. The original 1882, ten foot diameter, brake wheel, or “bull wheel,” that had been in use for over a century, was also replaced at that time. The incline cabs were also rebuilt in 1995. In 2015, the incline underwent a $3.5 million renovation, this time by general contractor Mosites Construction Co. who upgraded the rails, ties and cable, and rehabilitated lift components, and NexGen Industrial Contractors under a contract with Interstate Equipment Corp. of Pittsburgh who were tasked with removing the cars from the incline and renovating them. NexGen fabricated a work car for the incline which was used to facilitate removal of the passenger cars. The incline was closed from Labor Day 2015, until November 18, 2015 to complete this project.